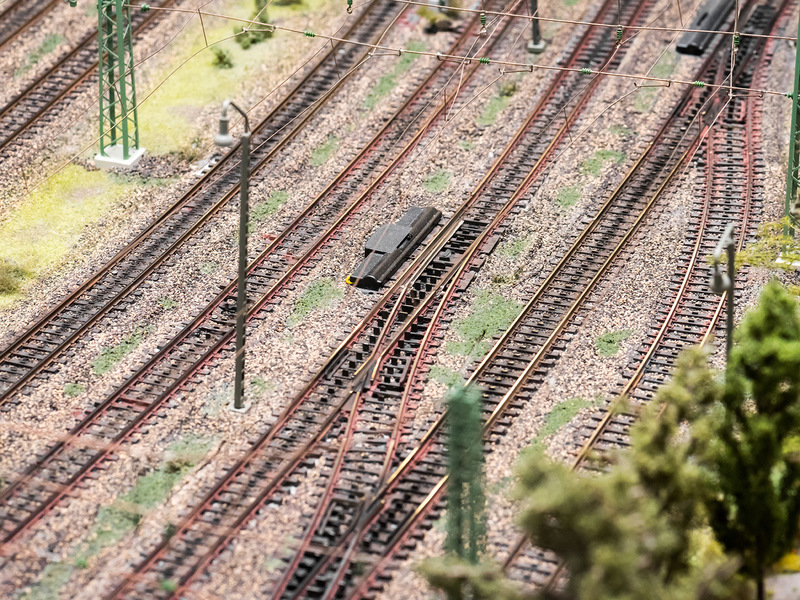 At the Miniatur Wunderland we use tracks from different manufacturers. Every system has its advantages and disadvantages. In the following article we have listed for you where exactly we use the different systems. On all our main routes in the Alps, Harz Mountains, Hamburg, the USA and Scandinavia we use K-tracks by Märklin. To connect other theme worlds with one another a main route with the Märlin K-tracks has to be laid out to access the entire site. In about 90% of the cases we use Flex-tracks and wide radius turnouts. The K-tracks are easy to install, very stable and they don’t need terminal loop modules. For all kind of tracks we have energy input every 150 to 200 meters. The contact sections are 10 cm long. 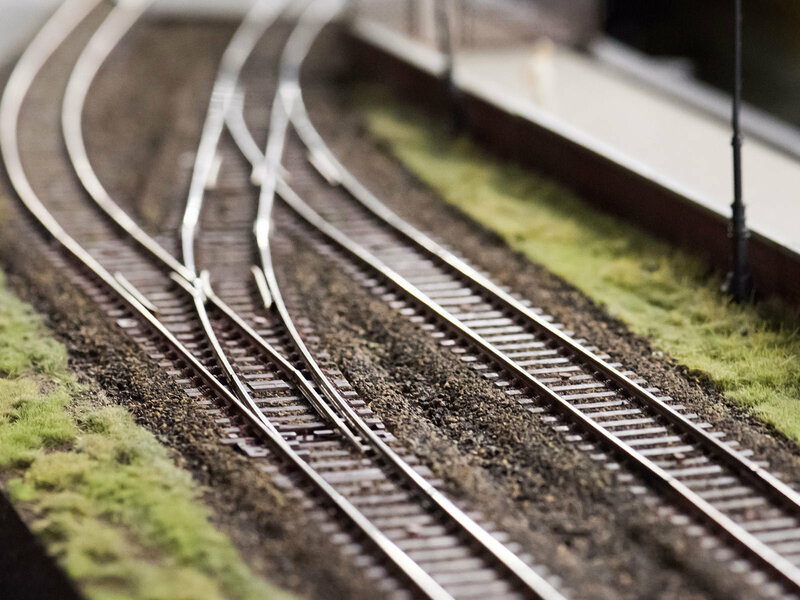 With the Märklin system it is not so important on which of the tracks you place them. But you have to make sure, that, when cutting the contact sections, the burr will not push into the neutral conductor and cause a short circuit. Unless you use a checking device these mistakes are really hard to detect. Afterwards you can fix the contact section with two-component-adhesive and once it is hardened you can sand the edges. We leave out the limit stop of the point machine because we control our turnouts through a decoder. If you operate on an analog level you should keep them, because otherwise your drive mechanism can be destroyed. The turnouts by Märklin have not yet been modified. This regards the construction sections in the Alps, the Harz Mountains, Hamburg and the USA. In Scandinavia we tried something new. In the visual areas all turnouts were equipped with the LGB point machine for which the turnouts had to be modified a bit. In the areas of our fiddle yards we use four millimeter strong cork as a bedding layer. The bedding is by Merkur and not yet distributed by the company. 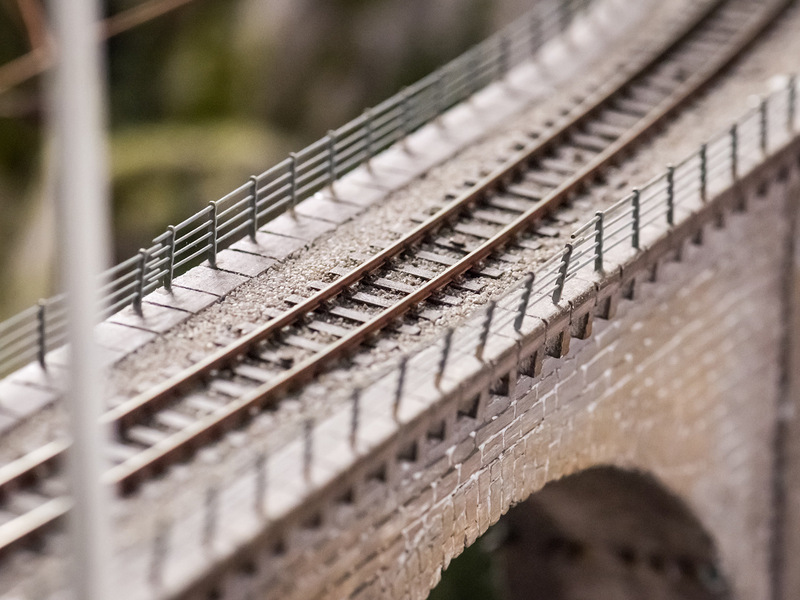 You can purchase it prefabricated for the Märklin turnouts, Flex-tracks and standard tracks. Roco-Line track is used in the Hamburg, Scandinavia and Italy sections. In the Hamburg section, we used the track with its original roadbed for the metro line (U-Bahn), light-railway (S-Bahn), and the cable cars. Why did we use Roco and not Märklin? Simple reply: 2-rail track is a worldwide standard. There is a lot more rolling stock out there for 2-rail track than for 3-rail track. Thus, we didn’t have the need for costly conversions of rolling stock. 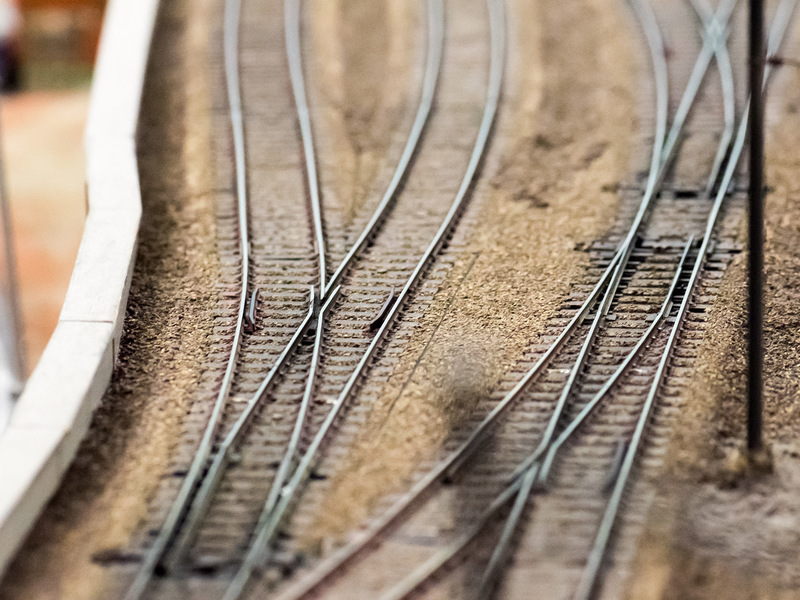 In general, 2-rail track is the winner if trackwork has be laid into streets (like harbour tracks or tram tracks) as it is very easy to fit concrete or cobblestone between the rails. In the Hamburg section we also used the original turnout motors. We don’t use contacts for the 2-rail trackwork but use occupancy detectors instead. These can be a couple of meters long. We use insulating track joiners to isolate the detection section from the rest of the track. One should also have expanding joints in the rails to avoid warping. One important point is the right polarity, especially in return loops. Using digital control, however, this not really complicated. The 9 mm track made by Roco is used for a narrow gauge road in the Harz section. It is very delicate and requires a lot of attention. Turnout motors are original ones and train control is also digital. In the Scandinavian section we not only use flex track but also 90 cms (abt. 3 ft) sectional track. In the staging yards it is laid on 4 mm cork, and in the visible areas it is laid on prefabricated subroadbed sold by NOCH. For the USA section we use the Peco track. Peco - code75 is a close-to-prototype proportioned DC track. We use flex track and several types of turnouts (switches). If you want to use Peco track in a digital system, there is at least one thing to take special care of: turnouts have to be equipped with a track feeder and the polarity of the frog must be switched according to the routed direction. Since this is a DC track, polarity has to be observed in order to avoid shorts; especially at turn loops. Here too, we work with occupancy detector sections which can be several feet long; they are separated from the rest of the trackwork with insulating track joiners. The track joiners have a very snug fit and deliver very good contact. We also need track gaps in this section to allow the trackwork some play (and avoid a "roller coaster" caused by warping tracks). The roadbed is ready made by NOCH since we don't have time to ballast the track manually. The switch machines are not made by Peco; instead, we use those made by LGB which are very robust. The decision for the PECO track was made because we hardly can buy American rolling stock at reasonable prices in Europe. The alternative would have been to convert all engines and cars to AC rail, a waste of time, resources and money. The USA section can accomodate trains of up to 15 meters ( 49.2 ft. ) which is mainly due to to the layout design, rather than to the technical possibilities. Thanks to digital control, all engines hauling one train are synchronized. This track is used in the Austrian Alps. In addition, a cograil is implemented for the cog railroad. Since the track is very steep, a normal locomotive wouldn’t be able to push a train up the mountain. The workhorse here is a class 91 “Edelweiss” steam loco (Fleischmann item # 4033). Turnout motors are original; control is digital and, as usual with 2-rail, polarity has to be observed.